On 19th of November, 2015 the Warsaw-based Lotos Poligrafia company hosted over a dozen representatives of another Polish printing houses. They took part in the presentations of the 5-color manroland R505 LV HiPrint press equipped with LED UV-based drying system. The event was organized by MPAJ (Polish distributor of AMS drying systems) and supported by ABC/Allied Pressroom Products Europe. ABC/Allied All Star Fount IPA-free fountain solution, manufactured in the Warsaw-based production plant of the company, is currently implemented in all sheetfed offset pressed used by Lotos Poligrafia. 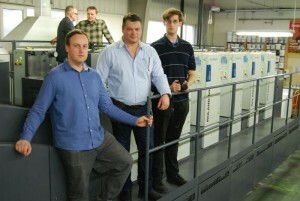 From left to right: Pawel Dreszer (Lotos Poligrafia), Konrad Lewandowski (ABC/Allied Pressroom Products Europe), Karol Dreszer (Lotos Poligrafia). The event gathered mid- and high-volume printers specializing in commercial and book production. They learnt about technical specification of the manroland press, equipped with a LED UV drying module and fed with IPA-free chemistry since several weeks. The presentations covered different jobs, printed either on standard offset substrates (e.g. 150-gram coated paper) or non-typical ones (e.g. synthetic papers, calque and foils). The participants of the event were welcomed by Andrzej Jablonski – owner of MPAJ company. As he underlined, the project realized in Lotos Poligrafia was the first case in Poland including implementation of LED UV module in an existing printing press. According to the management of this printing house, it allows for much quicker and more economical sheets drying. Moreover, the whole process is eco-friendly, too. A sustainability aspect is strengthened by IPA-free fountain solution manufactured by ABC/Allied Pressroom Products Europe. Pawel Dreszer, co-owner of Lotos Poligrafia, says: “Our co-operation with ABC/Allied Pressroom Products Europe started with implementing All Star Fount in recently purchased, 8-colour Heidelberg press in B1 size. We were very satisfied about results and measurable savings it brought to us. Therefore we decided to implement it in three other B2 presses operating in our plant. In case of manroland press, we initially dosed All Star Fount solution with several percent of alcohol. After gradual reduction, currently we print in 100% IPA-free environment”. Konrad Lewandowski, co-owner of ABC/Allied Pressroom Products Europe, adds: “After its recent investment in LED UV system, Lotos Poligrafia company became a market pioneer. According to my knowledge, it’s the first Polish company that implemented IPA-free chemistry in a sheetfed press equipped with this innovative drying solution. Besides measurable economical and ecological benefits, implementing ISEGA-certified All Star Fount solution allows to print direct food contact jobs”. Pawel Dreszer continues: “Currently we use this press for printing standard jobs, e.g. magazine covers in a circulation of 3 to 5 thousand copies, as well as orders using difficult substrates, which were problematic or required a lot of time before further processing. Our plans include extending the assortment with non-absorbent substrates, which were unavailable in common offset printing until the date. An innovative LED UV drying system and IPA-free chemistry are two important aspects of such a production, significantly increasing its economy and eco-friendliness”. It’s worth mentioning that besides a successful implementing of All Star Fount solution in all sheetfed presses at Lotos Poligrafia, ABC/Allied Pressroom Products Europe company has recently signed many new important agreements. They cover delivery and implementation of its IPA-free chemistry in another printing houses from different area of Poland. Konrad Lewandowski says: “We are extremely glad that our IPA-free products are being appreciated by a growing number of Polish printers. What’s more important, some of them start to use them in all their offset presses. Lotos Poligrafia is the best example of such a policy: after successful tests in the first press, All Star Fount was implemented in another presses very soon. We look forward to continue this trend and our growth path in 2016, too”.